Last weekend London and I finally went camping again, and I finally got the scope back out under reasonably dark skies. 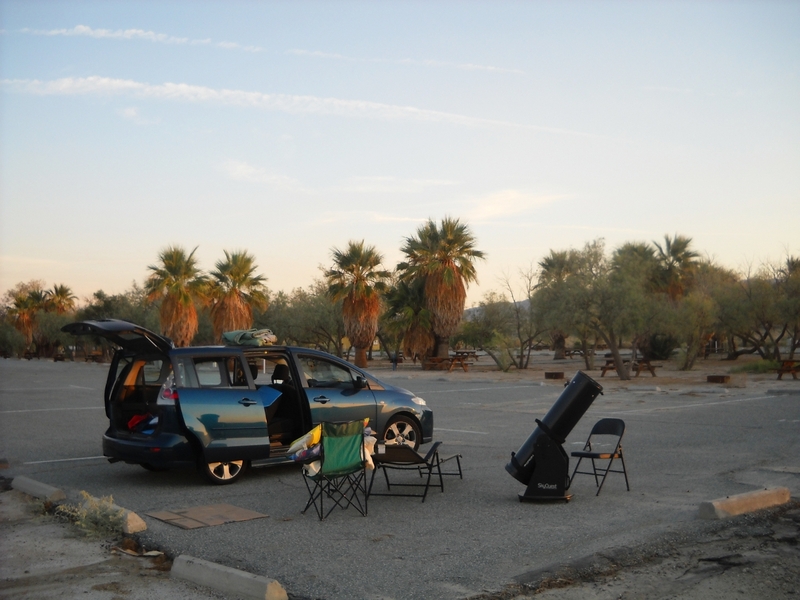 My last serious outing had been to Joshua Tree at the beginning of May. There are several reasons for the long hiatus. The first is simply heat. We do most of our camping in the spring and the fall because it’s just too darn hot in the summer, at least at our preferred desert destinations. Yeah, we could go up into the mountains and fight everyone else trying to do the same, but I’ve never felt any strong motivation to do so. A big part of going camping, for us, is to get away from crowds of people, which is one of the many reasons we like the desert. The second is teaching. My day job is teaching gross anatomy at Western University of Health Sciences in Pomona. The anatomy courses run from mid-June to the end of October, and during this stretch I usually have little time or mental energy for anything besides anatomy. The third is research. My appointment at WesternU is half teaching, half research. Usually I do almost nothing research-related during teaching time; I have from November through June to worry about dinosaurs. But this year a couple of big research-related events intervened and kept my head in the research arena even during teaching time. The first was a paleontology and anatomy conference in England in September, which I attended and spoke at. The second, and far more intense and important, is that at the beginning of August I took on my first graduate student. Which has been a lot of fun, but has also eaten up the spare cycles that I would normally devote to astronomy. So, to sum up, the heat has kept me out of the desert, teaching has had its usual effect of monopolizing my attention, and research has scavenged what little teaching left over. Until last weekend, anyway, when I was overtaken by one of those too-rare bouts of clarity in which I say to myself, “Why on Earth am I overthinking this? Camping is fun and easy, and packing the car takes less than an hour. We should just go.” And so we went. 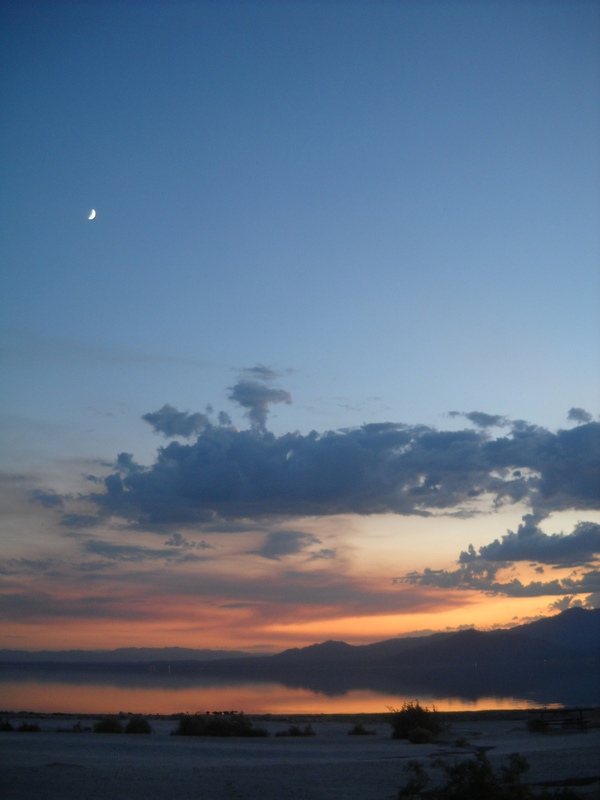 Despite the earlier bad news, the Salton Sea State Rec Area is still open, at least for now. Don’t know if that’s because the state backed down of full closure, some community group stepped up to keep it open, or no-one’s gotten around to actually stringing a chain across the entrance (I jest; the lights and water were on, and there was a camp host present). That’s pretty much my default destination: it’s close, reasonably dark, has good horizons, is paved all the way in, and has lots of room for London to roam in relative safety with little supervision (i.e., flat, no cliffs to tumble over, and the water is too nasty to contemplate any sort of activity that might lead to drowning). We got there right at sunset and quickly set up camp. Which basically means setting out the telescope, camp furniture, water, and food, moving all the other gear into the front seats, and making our beds in the back of the Mazda. I like to have all of this squared away before dark; come 3:00 AM I want to be able to climb into an already-made bed and just crash, and not futz around with making any further arrangements. I also got a fire going, and pretty soon we were roasting hot dogs and the making s’mores, our usual camp fare. The young crescent moon was setting across the water, and as darkness fell the bats came out and started zipping through camp like little silent stealth fighters. London and I dig this; the bats are fun to watch and it’s nice to know that they’re around and keeping us bug-free. London’s astro-enthusiasm waxes and wanes, much like my own. On some nights all he wants to do is lay out and watch for satellites and shooting stars, and other times he wants to do his own things. Last Saturday he climbed into his nest in the back of the car and played on his Leapster for about an hour (the most time he had spent playing with it in weeks), while I spent some quality time taking in the young crescent moon. I had the wrong camera along. Whereas my decade-old Nikon Coolpix 4500 is endlessly user-adjustable when it comes to settings, my newer Coolpix L19 has no way to manually set the exposure time, so it’s worse than useless when it comes to digiscoping. And the 4500 was back in my office. So no moon shots this time around. After a while London was ready for some Daddy time so he crawled into my lap and we took turns telling stories until he got sleepy. Sometimes he’ll actually go to sleep in my lap, which is nice, because I know the days for that are growing short. But this time he recognized when he was sufficiently tired, took me to the restroom for his nighttime ablutions, climbed into his nest in the back of the car, and fell asleep almost immediately. Unlike my outings this spring, this time I wasn’t attempting a Marathon or working on a big observing project. I just wanted to plink around the sky and reacquaint myself with the craft of observing. As usual, I split my time between telescope and binoculars. This is a great time of year for observing: the summer constellations are still up right after sunset, and by just after midnight the winter constellations are rising. 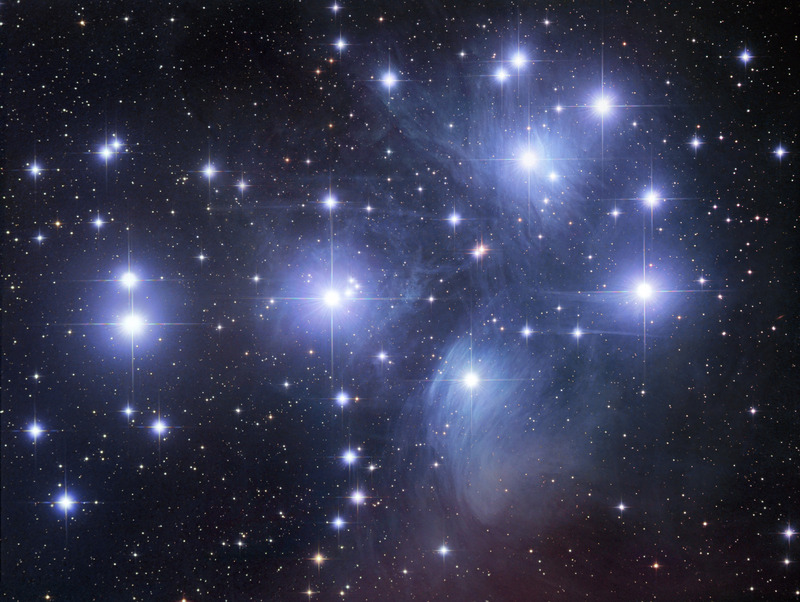 I started with the Great Glob (M13), the Ring Nebula (M57), the Wild Duck Cluster (M11), and Albireo, one of the finest double stars in the sky. By then Jupiter was high enough to be out of the near-horizon roil and showed about half a dozen dark cloud belts in the XT10, and some finer storm detail. After Jupiter I moved on to some autumn favorites: the Pleiades (M45), Andromeda galaxy (M31) and its satellites (M32, M110), and the Double Cluster (NGC 869/884). I could see some hints of the dust lanes in the Andromeda galaxy, but nothing like I saw last fall at Afton Canyon; the Salton Sea is dark but not that dark. Those were all telescopic observations, and they had carried me around the sky to the north, where the winter Milky Way was rising. I flopped into the lounge chair, grabbed the 15x70s, and laid back for some binocular stargazing. Cassiopeia in particular is a fantastic area to explore with binoculars; there are so many star clusters that the trick is not usually finding them, but figuring out which among the dozens you’re looking at. I thought about grabbing the atlas and sorting through it all. Then it was back to the lounge chair and binoculars to revisit all of these targets and more. And eventually, back to sleep under the stars. I did wake up later on and crawl into the car for some deeper sleep, but falling asleep under the splendor of the Milky Way was one of my favorite experiences in astronomy. I was away too long. I can’t wait to go back out and do it again. 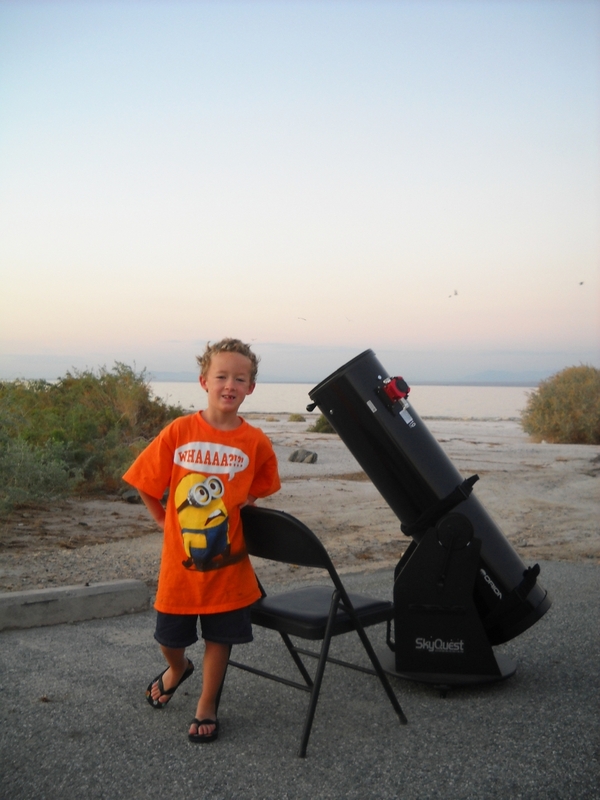 You are currently browsing the 10 Minute Astronomy blog archives for the day Sunday, October 9th, 2011.